I may or may not have an obsession with argyle so I totally loved it but didn't have any grey yarn. I also DID have a couple of packs of red hearts I had grabbed out of the dollar bins at JoAnn awhile back. So, I cut up an old grey t-shirt (note, this is NOT t-shirt yarn in mine, it wasn't the right kind of t-shirt but it turned out alright). I wrapped a basic foam wreath with one looooooong strip of grey t-shirt then hot glued the hearts on. Once those had cooled, I wrapped the wreath with medium black satin ribbon then medium pink ribbon then finally skinny black ribbon. It took very little time and I'm quite happy with the results. 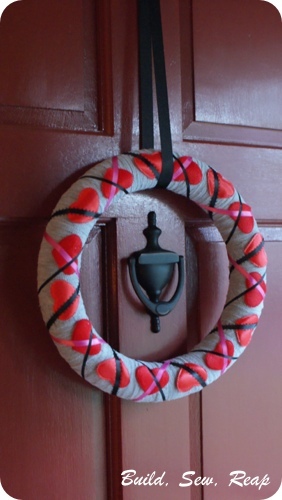 Are you making a wreath for Valentine's day? If you've blogged about it, please feel free to drop a link to your creation in the comments. Love Love Love! It's like Valentine's Argyle! May have to break my " No Decorating for Valentine's" streak! Our first boy's birthday is Feb 11, so I normally skip the decorations for Valentine's! What about putting up a wreath on the 12th or earlier then switching it out for a birthday wreath on his birthday (then switch back on the 12th)? I'm struggling with when to do holiday decorations now with the baby's birthday in mid December.I think we will continue to do outdoor decor starting in early December then the tree goes up the day after his birthday. I love celebrating each holiday with decorations but don't want to lose birthdays in there.